This work contains the first comprehensive description of Sabanê, an endangered language of the Nambikwara family, spoken in Southern Amazon, Brazil. The Sabanê live divided over two villages in the states of Rondônia and Mato Grosso. While around 140 people regard themselves as ethnic Sabanê, only three speak the language as their mother tongue, all of whom are over sixty years old. The language is no longer used in the community, and is therefore severely threatened by extinction. 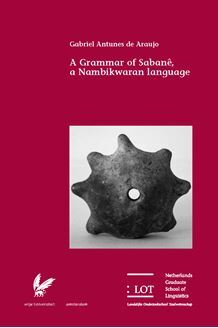 Thus, this work intends to contribute to the documentation and maintenance of the language. This study is based on first-hand data collected in fieldwork trips conducted between 2000 and 2004. This Grammar contains a description of the Phonology, the Morphology, and the Syntax. The book is of interest to scholars of South American languages, Nambikwaran languages, linguistic typology, grammar, and general linguistics.